Best Pet Door for Sliding Glass Doors! We love pets! All our products are made in the U.S.A. to top quality standards. Pet doors are an excellent way to improve your pet's quality-of-life and provide the convenience of not having to let them in and out. If you're looking for an energy efficient solution to provide your pets more freedom and exercise - you've come to the right place! 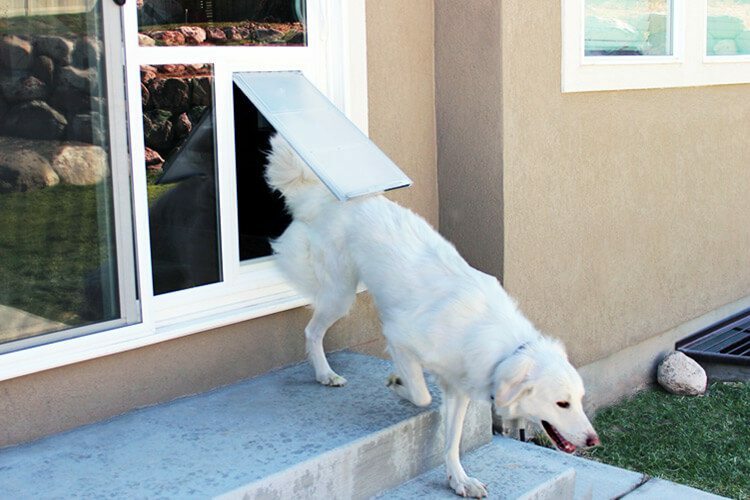 This high-quality pet door is the latest innovation in pet-friendly dog door solutions for your sliding glass door. 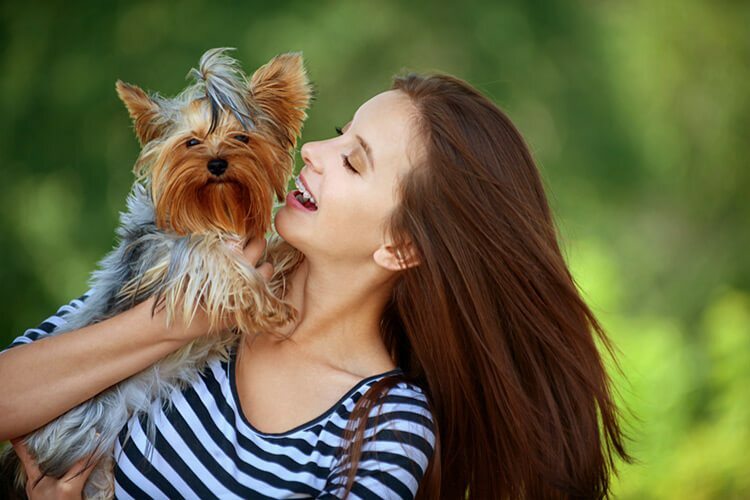 Our team of pet lovers is dedicated to providing you the best service - we're here to help! Call today at (801) 973-8000! Patio Pet Doors come with a limited 15-Year Warranty to be free of defects in materials or workmanship. Do you get up at all hours to let your pet in or out? Freedom for you and your pet is as simple as installing a patio door pet door! Installed with the "In-the-Glass" Pet Door, nothing has to change for you. Traditional pet door inserts typically reduce the door width by the width of the insert, and often mean people can no longer use the door! With our "In-the-Glass" pet door, the sliding glass door still fully opens and closes normally. So your pets can enjoy the luxury of coming and going as they please without interrupting you. Your pets have the freedom to come and go without your help. Patio Pet Doors are custom-built to fit your patio door and your pet! Your Patio Pet Door insert is both secure and easy to use for you and your pets. Environmentally friendly flap seals tightly against the weather. Patio Pet Doors are maintenance free and come in white or tan. Easy enough to Do It Yourself or take advantage of our professional installation. Patio Pet Doors inserts include a limited 15 Year Warranty against failure. Custom Patio Pet Doors come with a variety of choices & available financing. Energy-Efficient Doggie Doors in 5 Easy Steps! The Patio Pet Door insert is a complete system. It replaces the glass in the sliding door panel of with an attractive low-profile pet door design. Its unique mounting system is built to the existing glass unit size and requires no special fasteners. We use insulated, energy efficient safety glass in the door and the flap is designed to magnet seal to reduce energy loss. Door height is measured on your Pet from the floor to the top of their shoulder when standing. 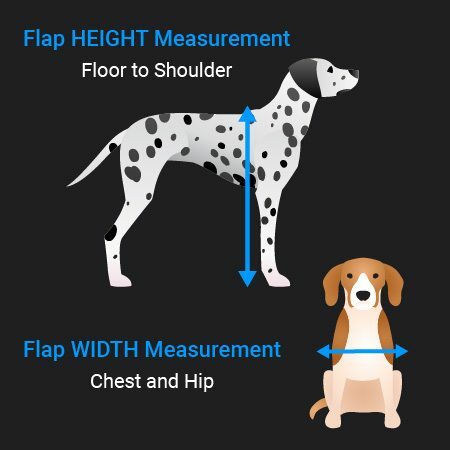 Then measure the width of your pet’s chest and hips, then use the widest measurement. To ensure your pet fits through the door comfortably, add one or two inches to both dimensions. 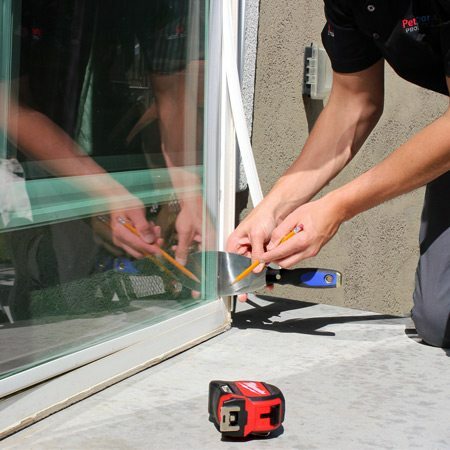 Measure your window pane for the size and thickness of glass. Then choose between a variety of energy efficient glass ranging from the best LoĒ 366* to clear. How energy efficiency the glass is, depends on the amount of light, ultraviolet rays, and solar radiation that passes through, etc. Take note of whether your door opens from the left or the right when standing outside looking at door. Our Pet Doors are designed to require simple and smooth installation. If you choose to do it yourself, we provide clear instructions and prompt customer support. Or use a professional installer who can also handle the final measurements is a great option. Or you are welcome to complete this simple form for a Free Estimate! We are proud to be able to donate 5% of our proceeds to the Humane Society of Utah (HSU) and 10% of proceeds coming through any HSU’s sources: social media, etc. directly. We also continue to spotlight a pet to be adopted and we pay the fees! As a regular sponsor of the Make-A-Wish Program, we are blessed to help the grant the wishes of children diagnosed with a life-threatening medical condition in the United States. A portion of every sale goes towards helping to turn wishes into reality. How to Size Dog Door? To measure for a dog door is a simple 3-step process. First, the width is based on how much space your dog requires to pass through the entryway with a 1-inch clearance on both sides. Have your pet step through a regular door with only opening it enough for them to comfortably get through – that is your measurement for width. Second, for height, measure from the floor to the top of your pet’s shoulders (not their head). Third, using those two measurements, match you measurements to the door that fits your pet best. Pick a small, medium, large or extra-large door. How to Lock / Secure Dog Door? Our dog doors come with an optional secure locking cover to prevent unwanted guests when the door is not in use. How to Install Dog Door into Glass? For pet doors built into a glass door, you can have your dog door professionally installed or you can choose the do it yourself option. If you choose the latter route, take advantage of our easy DIY instructions. In eight simple steps, they will walk you through the process, from removing glass stops and the existing glass from the frame to replacing the door sash. Our other pet doors have a simple close into place installation. Which Dog Door is Best? Our distinguished pet doors are highly rated in terms of quality. They are designed for optimum home security, pet safety, and energy-efficiency. Your pet can come and go without being hurt by the flap, and you can choose a double-flap option for additional weather resistance. Our doggy doors are easy to install and cheaper than electronic products, which operate through a sensor on your pet’s collar that can be broken or misplaced. Where to Install Dog Door? You can choose a pet door for French doors or dog doors for sliding glass doors. 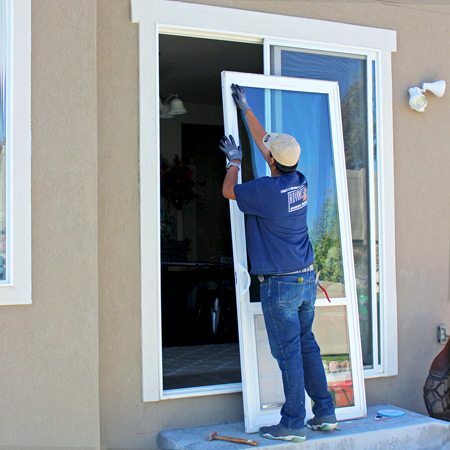 We will replace the glass or the whole door with the pet door built right into the glass; or choose our pet doors that can be installed into window sashes. Will Cats Use a Pet Door? Absolutely! Cats are independent, curious creatures who enjoy being outdoors. They are natural explorers that benefit from physical activity and stimulation opportunities that engage their instinctual behavior. We offer a cat-specific panel window insert with various flap sizes, colors and adjustment ranges in addition to a removable pet door panel insert that can be used by cats, as well as small dogs. Can You Install Dog Door in Double Glazed Glass? Yes. We provide several different types of glass for pet doors. They differ in terms of low emissivity visible light transmittance, fade transmission, and solar heat gain coefficient, giving you the ability to choose the style that best fits your needs and preferences. Can Mice/ Rats Come Through the Dog Door Flap? No. Our pet doors come with high-weather stripping, strong magnets along the edges, and stainless steel strikes that create a tight seal and eliminate gaps. Insects and small animals, such as mice and other rodents, do not have the strength to push through a pet door. Larger animals are unlikely to push against a door that is tightly sealed to the floor and frame. We recommend, however, that food and water not be placed near the pet door where they can be detected by unwelcome creatures. Can You Put a Dog Door in a Window? Yes! Our durable and sturdy windows inserts are perfect for cats and small dogs, PLUS no tools are required to install them into an existing sash window. With a highly insulating flap, they are designed to stay closed in winds up to 50 mph. Why Do Dogs Scratch/ Bark at Door? When pets need to go outside to relieve themselves, come inside to eat or drink, or are suffering from separation anxiety, they will scratch at the door or even start barking or meowing. By installing a pet door, you give your pets the freedom to enter and exit at their leisure, mitigating these undesirable behaviors and your responsibility to constantly open and close the door. Pet doors give your dog control and freedom. They are a better option for both the animal and the owner than dog houses, which require you to still be involved in bringing your dog inside or taking them out to the enclosure. Dog doors also let your pets easily come inside during extreme weather or to sleep, while also allowing them the option to escape if there is an emergency, such as a house fire.